It comes to no surprise that Autumn is my favourite season. I say it a lot! I know. It's the chunky knits, warm mustard tones and oh the boots, how I love the boots. I have a slight obsession with ankle boots and I’m eyeing up some new numbers to add to my collection, someone please stop me. Actually, no I think I need them. It's amazing what cute outfits you can come up by adding cute ankle boots and a chunky knitted cardigan or jumper, my outfit choices are forever changing. A switch up with textures, fabrics and colours is always a great chance to bring a fresh new twist to your outfit choice. I'm finding myself playing around the styles and trends that I haven't done before and I'm loving them. Last month I got the cutest mustard sweatshirt for lounging around in but it's now becoming my go to choice for comfort and making an impression. I'm actually a little bit in love will mustard and now I always make a beeline for that colour when shopping. With Autumn does mean that I am spending more and more time outdoors with my family, October has been one of the busiest months on the calendar for us and it doesn't seem to be stopping anytime soon. I love spending time outdoors with my daughter and husband going on woodland walks, collecting conkers or just heading into town for hot chocolates. It's the fresh crisp colder weather that make afternoon strolling around our area so much more exciting and the photo opportunity are amazing. 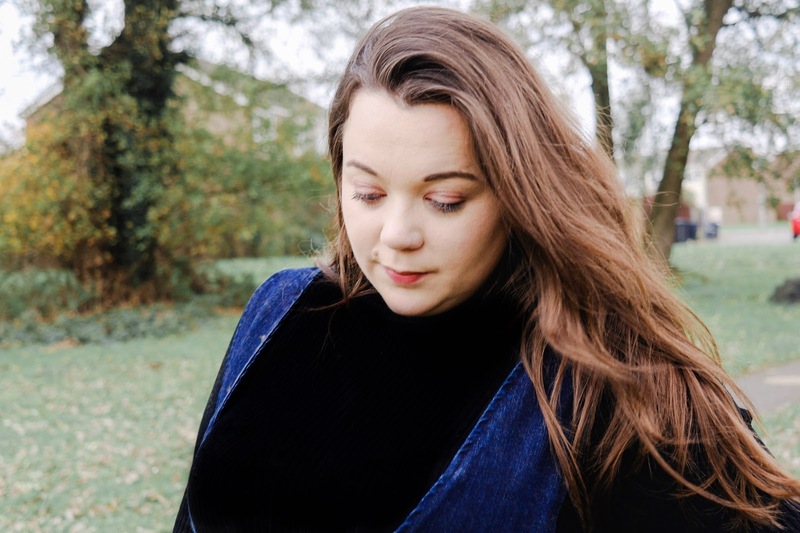 So in light of all things Autumnal I thought that it would be a good time to show you some staples that I have been adding into my wardrobe that I'm loving at the moment. Pinafores! 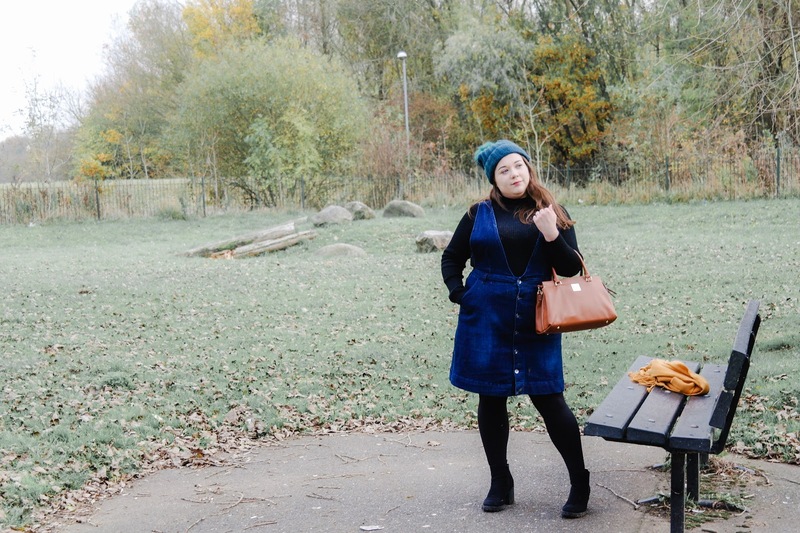 Yes, this is something that I wouldn't normally go for due to my body shape, but actually if anything pinafores are actually a fantastic staple to add into your autumn wardrobe that are great for any body type. 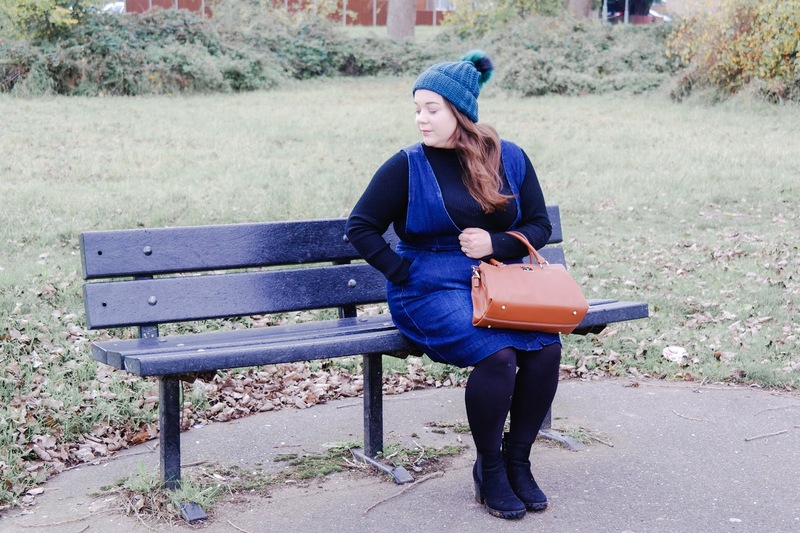 This Deep V Denim Pinafore dress is the perfect for creating some of the most cute Autumn looks. 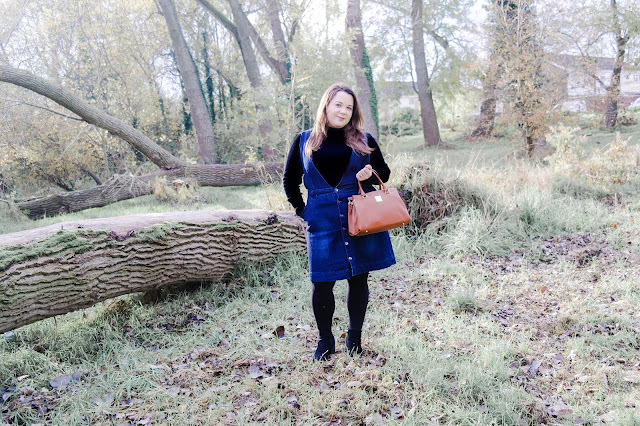 Every wardrobe needs a staple denim pinafore as it's such a transitional piece. You can wear this one with tees, sweatshirts, roll neck jumpers or chunky knits. Paired with some opaque tights and ankle boot make it the perfect staple to add into your collection as you can go from woodland walk to night on the tiles in an instant - the possibilities are endless. This denim pinafore is totally comfort stretch denim so there's no need to compromise on comfort over style, with this denim dress you can have both! 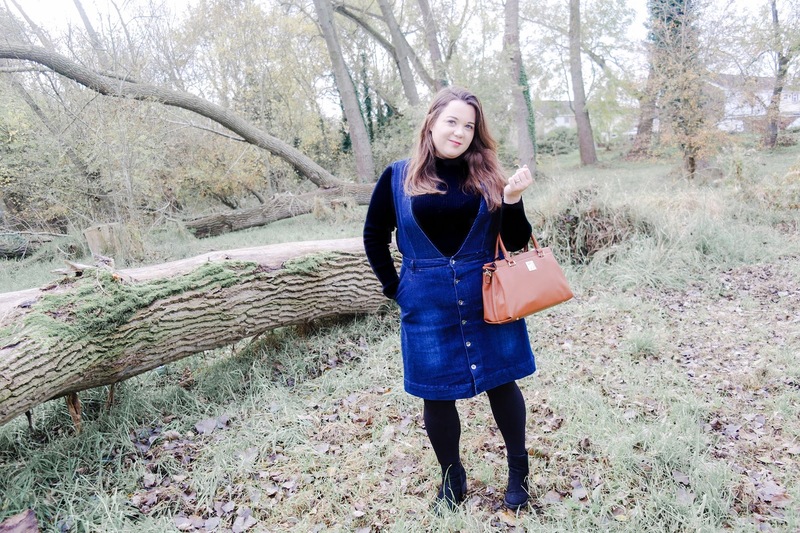 Now I love paring this deep V pinafore with a simple black ribbed high neck jumper, but this jumper is perfect on it's own or as a layering piece. Simply tuck this jumper into a skirt or pair with jeans for a classic everyday look. Now I have worn this jumper a couple of time already and it hasn't lost it's shape whatsoever and is very comfy. 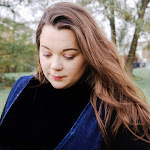 I have to say that this is so great for transitional piece as you can pair with jeans and boots for a simple but classic look or you can pair with pinafores, skirts or short with opaque tights and ankle boots. It's such a versatile piece. When it comes to creating the perfect outfit, creativity and personality are absolutely essential. The way in which you present yourself can speak volumes about you as an individual as well as other factors like your personal tastes and preferences. So when you are considering your choice of outfit, it is also important to think about more than just which clothes you want to wear. Accessories have the power to make or break an outfit – from shoes to bags to jewellery and so much more, the right accessories can instantly transform a dull outfit into an incredible one. Ankle boots are my staple! They are great for long autumnal walks yet they can also be paired with a summer dress for those random sunny spells that still linger throughout the last few months of the year. You can even tuck your woolly leggings into them once winter is in full swing, making them a sound investment. Is that enough excuses to treat yourself? I am already eyeing up a pair of gorgeous brown suede ankle boots. Every woman needs a pair of classic black ankle boots in her wardrobe – these block heels are super smart and go with practically everything. 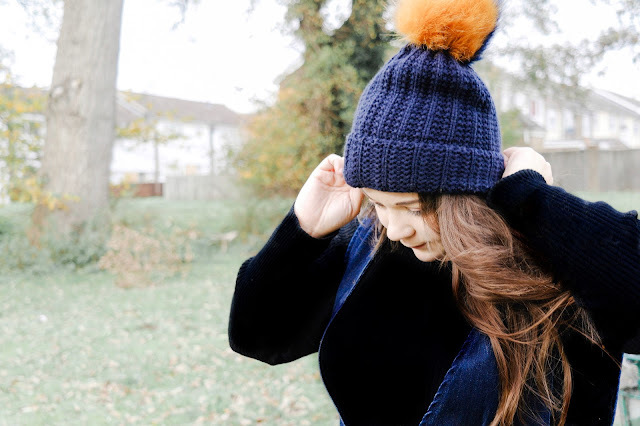 People seem to love a bobble hat—myself included. Bobble hats have a simple fit that is universally flattering, are soft, and come in a bunch of colors. These are great for keeping your ears and head warm on cold autumn days, plus they add an effortlessly cool look to any outfit and great for three day hair! I have been buying so many bobble hats and have found so great ones at Primark for less than four pound, you can't really go wrong with that. 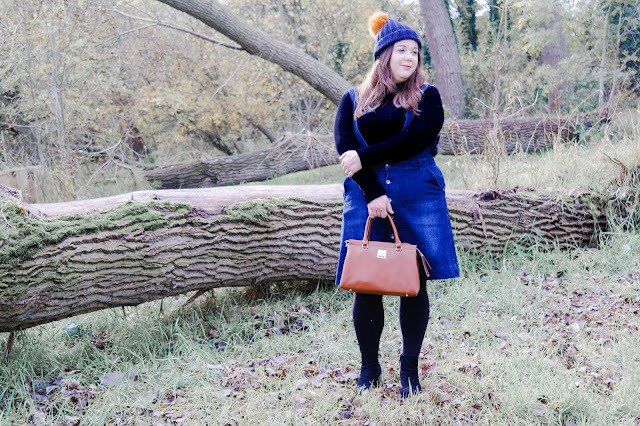 I have a gorgeous navy one with a two tone navy and mustard bobble and paired with a mustard scarf does my outfit wonders. This post is in collaboration with Fashion World. 9 comments on "Updating Your Wardrobe For Autumn"
Aw thank you so much for saying that, you little cutie! I love thick tights with skirts and wooly hats, it's such a cute look and my go-to! Gorgeous! I live in thick tights and ankle boots in the winter, and my bobble hat is never far from my head! Actually I'm wearing it right now, indoors, that's how much I hate being cold! haha! have been feeling really down about myself recently so haven't bought anything but this is defo inspiring me to buy some new autumn staples! Oh I love Autumn fashion. Beautiful boots, chunky knits and bobble hats!! You look fab!